About a month ago there was a minor flare-up around town about the millions of dollars the military spends on its bands. Washington Post writer and columnist Walter Pincus made himself something of a persona non grata around the military band community after a series of columns and articles detailing the Defense Department’s musical expenditures. He called into question whether, in a time when “austerity” is the new global phenomenon, Big Defense could justify the money. But whether you are in with the Pincus, slash-the-bands crowd, or you are marching in step with The President’s Own, surely this story, which I first saw linked on Time’s “Swampland” blog, can warm even the most miserly of hearts. 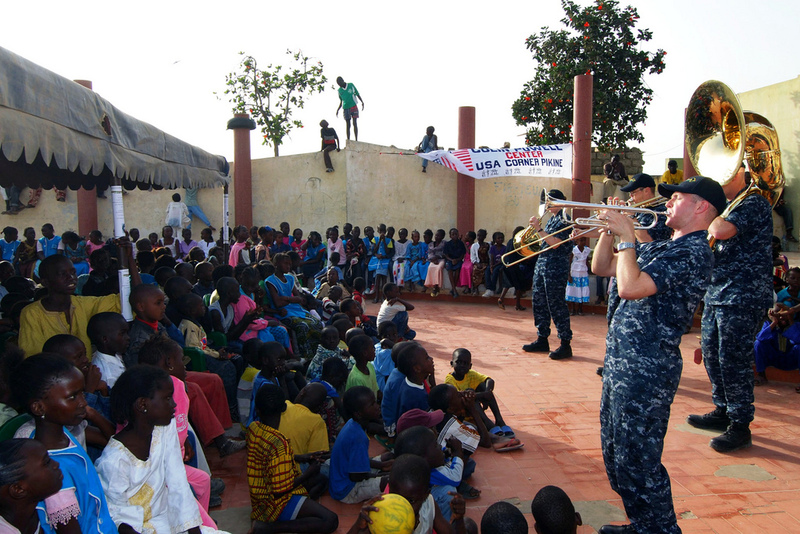 The United States of America Naval Forces Europe Five Star Brass Band yesterday held a brief entertainment session at the Milton Margai School for the Blind at Wilkinson Road in the West End of Freetown. The session, which lasted for less than an hour, created an atmosphere of relief and a sense of belonging among pupils of the Blind School. Officers of the U.S. Navy played entertaining but educative songs with their first class musical instruments, most of which comprised of trumpets. The session was geared towards achieving a cultural diversity, precipitated by the U.S.A-Sierra Leone diplomatic relations.